Say a fella wanted to ground his stereo receiver in the entertainment center. (He's a friend of mine. ) 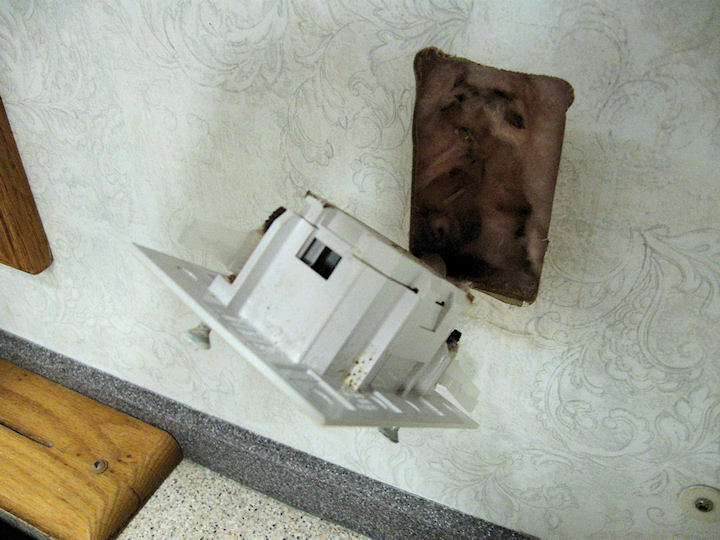 He would start by removing an outlet plate to see if he could run a ground wire to the exterior plate screw. So I...he tries to remove a coupla plates and gets nowhere. Seems like the two plate screws fasten to the wall rather than a box, but the outlet and plate won’t budge. Like there ain’t no extra wire in the wall. This fella could pull a lot harder, but doesn’t want to take the chance of fixing something that wasn’t broken (yet). Can a guy remove these outlets? And are they grounded? If not, any suggestions on finding an easy ground in this area of the slide next to the frig? 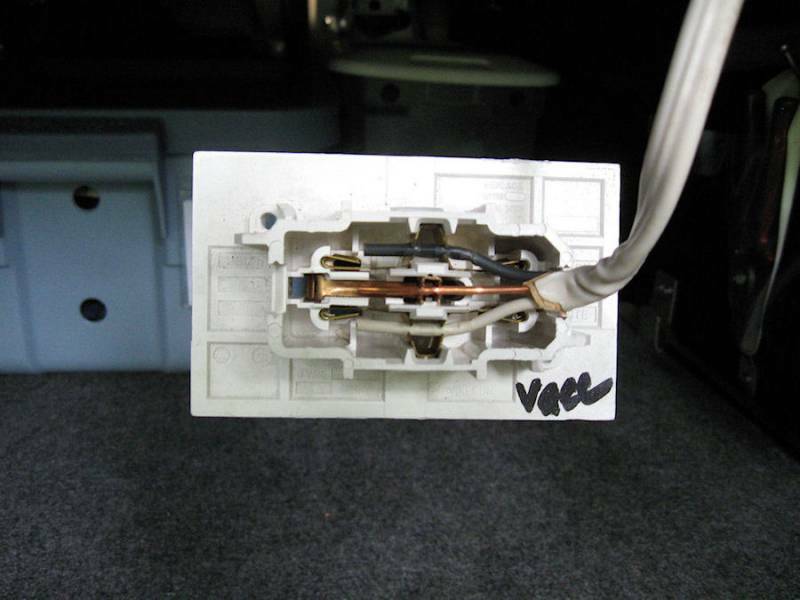 My Coach is a Winnebago but I can tell you my experience with removing electrical outlets. The electrical boxes in my Coach are a little like the plastic remodel boxes you buy at the hardware store. I was able to remove one of mine and the connections are pressed in to Vee shaped metal slots. The ground wire doesn't contact the mounting screws in any way. Bruce, you brought up a very good question. I know all the receptacles are three wire so they are grounded to the trailer's electrical system. You could place your ground wire to your stereo and wire the other end to a male style plug and terminate it on the ground prong. Then by plugging it in you would have a grounded stereo. This does bring up another question, is the shore power of the camp ground properly wired and grounded? I have been seriously been considering driving my own ground rod and grounding the trailer's frame. Think about it...... we all put pads under the jacks and the rubber tires stay on the ground, so the trailer is isolated from any earth contact and we rely on the ground connection when we hook up to shore power. I am not saying this is for everyone but to me it would take away some concerns of the CG's electrical system. Bruce, you brought up a very good question. I know all the receptacles are three wire so they are grounded to the trailer's electrical system. You could place your ground wire to your stereo and wire the other end to a male style plug and terminate it on the ground prong. Then by plugging it in you would have a grounded stereo. Hey, what about one of those three wire converters with the metal tang on the bottom for the ground? Like this >> adapter link. My receiver plug has no ground so I can plug into it. Not a problem in my case. I have a Progressive Electrical Management System, which cuts the power if have no ground. The rigs are not usually built with excess wire in the wall as this wire can vibrate and rub while in transit and eventually cause a catastrophy. My recommendation for this would not be find an additional ground but something a little different. There should be a ground attached to the plug of the outlet, this would be your power ground. when the rig is connected to the pedistal the rig is grounded. this doesn't cover when the generator, batteries, or solar is being used. I actually just placed a product in a rig that takes the power that comes from the wall, regenerates it from AC current, to DC current, then back to AC current making it perfectly clean power thus preventing the need for the power ground. Most audiophiles only ground the equipment when they have multiple power sources or they have a hum coming through the speakers. I have photos of what I did and the products I used. who knows, it may help. Something to consider, if the campground ground system is defective and there is a problem, you added ground rod AND your RV power cable will carry all of the current from that fault. It is the same reason most ham radios and communication gear fuse both the positive and negative wires of the power cable, the fuse will blow so that the radio doesn't carry 200 amps to start the vehicle should there be a problem on the ground side of the battery. Just some food for thought while we are having fun with the discussion. If I understand, the stereo plug only has two prongs and you want to ground the receiver. Does the receiver have a grounding screw on the back of the case that is marked for grounding? Without a three prong plug on the receiver or a ground screw....what were you going to attach to. The three prong adapter would work for a ground if you connected your wire to the tab with a small bolt/nut, as that is a ground. I've seen others that have a short length of wire in place of the tab. Attached are three photos. Two are of the outlets that should be simular to mine. There not the same as in most residentals. They should be able to be removed from the wall....I've tried two and was only able to remove one. 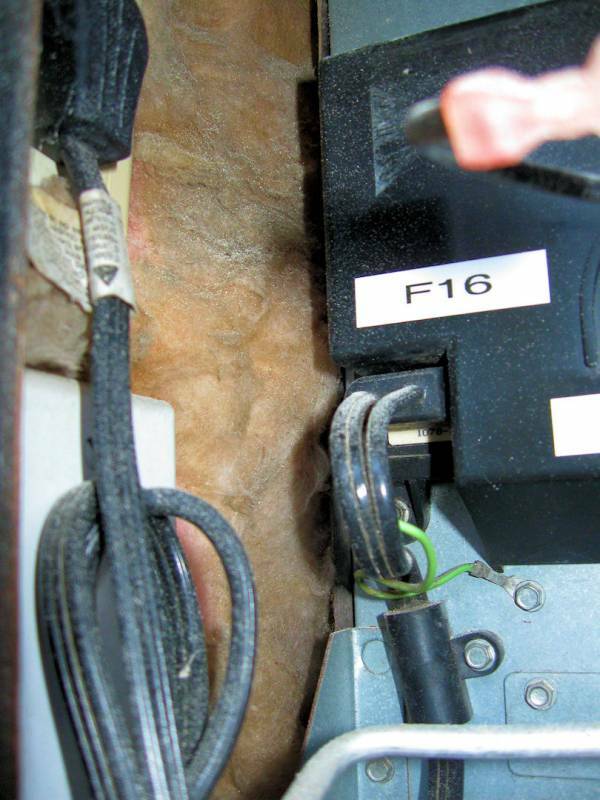 The third photo is of the rear of the refrig...it shows the power cord and the green wire/ground is attached to the frame of the refrig. You should be able to remove one of the same screw and attach another ground there and run it to the receiver as a ground.